Peaks and Pints use to love Tuesdays. Sandwiched between the protracted psychotic episode of Monday and the soul-crushing tedium of Wednesday, Tuesday is a peanut-buttery buffer of soothingly mediocre experiences. 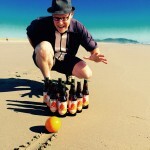 Productivity is high, outlook positive and acid reflux pleasantly fruity. Well, not anymore. In some belated — and misguided — response to Thursday being the new Friday, Tuesday has become the new Wednesday … or Monday … or both. Want to schedule a 6 a.m. breakfast meeting? How’s Tuesday look for you? Family emergencies? Bad hair? Exhausting games of one-upmanship with the office alpha male? Ah, Tuesday, we see you are a worthy opponent. Thankfully, this Tuesday, today, is National Peanut Butter Day. 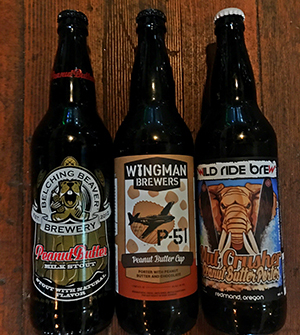 The peanut-buttery buffer is back on, and by back on we mean Belching Beaver Brewery’s Peanut Butter Milk Stout, Wingman Brewers‘ P-51 Peanut Butter Cup Porter and Wild Ride Brew’s Nut Crusher Peanut Butter Porter. These three delight’s roasty, toast-like bodies mesh cleanly with the peanut butter, bolstering a peanut blast without the oiliness. Peaks and Pints has all three of these nuts in our cooler. Wednesday, we didn’t mean all those things we said. Please call us. We know we can work it out.